Sixty programmes received £184 million in High-End Television Tax Relief (HTR) in 2017-18, according to UK government stats. 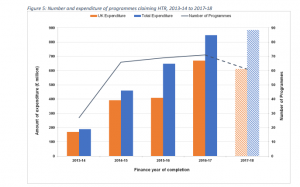 In total, HTR was paid to 180 claims, with each show able to make several claims during the production process.The government said that the 60 shows accounted for UK expenditure of £612 million (€685 million). 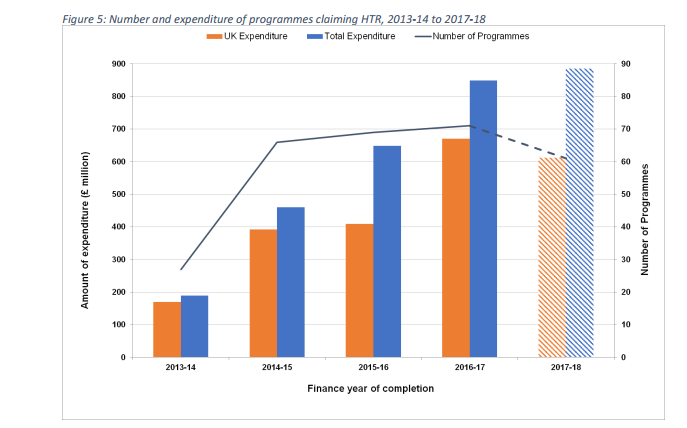 Since HTR was introduced in 2013, some 310 programmes – including BBC drama the Peaky Blinders – have made claims, accounting for £2.4 billion of UK expenditure and £3.2 billion of total expenditure, said the government. This resulted in 535 individual claims and a total of £563 million being paid out. Separately, there were 15 children’s television programmes completed in the UK in 2017-18 that claimed Children’s Television Tax Relief (CTR), with UK expenditure of £24 million. In the past year, £13 million of CTR was paid to 50 claims. A total of £18 million has been paid out in response to 85 claims for CTR since the introduction of the relief in April 2015. High-end television, as defined by the government, is programming that costs £1 million per hour to produce on average and has a slot length that is greater than 30-minutes. HTR was announced in 2012 and introduced on April 1, 2013. HTR allows qualifying companies to claim a deduction in their taxable profits or, where that deduction results in a loss, to surrender the tax relief for a payable tax credit.